In 1979, Beirut scored a coup in the watch world when class act Audemars Piguet opened their first Middle Eastern boutique. Unfortunately, the revered Swiss horologists were ahead of their time — the Civil War arrested both commercial enterprise and the city. 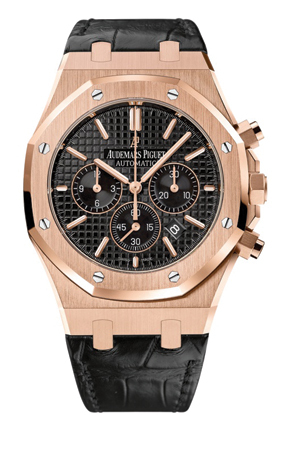 However, fast forward to 2015 and Audemars Piguet is back, bold and beautiful to behold in a new Downtown store on Weygand Street. The shop’s neutral palette of creams is balanced by dark wood and blends in nicely with the surrounding chic of the central district. Here, the past has indeed been erased, even if the boutique manager has no recollection of that first little shop opened so precariously during the war. Inside the boutique (which physically resembles one of its own showcase cabinets on the outside, with a polished glass façade and a ‘look don’t touch’ vibe), are some of the world’s most exquisite chronographs. Inoffensive jazz plays across a soft beige carpet and black paneled walls, and silver teardrop lights hang from the ceiling. The ambience, as a whole, ticks with a discreet kind of opulence as I settle into a deep leather chair to begin my perusal of the much more than arm candy. 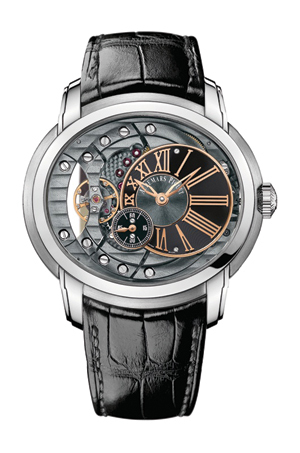 The pieces with high complications, some more expensive than houses (watch prices begin at $15,000), are brought to me on a velvet tray and I cannot help thinking how the booty used to create one watch would see an old fashioned pirate well into his retirement. Many have 18 carat gold bracelets, platinum casing, diamond set dials and sapphire crystals, all piled up so the finished product sits as heavy as a small cannon ball on the wrist. But that’s not really the point. The point is that this is the still independent, family owned brand behind the minute repeater and jumping hour watches (in the 1920s), the world’s thinnest wristwatch (1940s), and the first self winding caliber that was considered the world’s thinnest (1960s). These were followed by ultra thin, self winding wristwatches with perpetual calendar and tourbillon movements in the 1980s, Grande and Petite sonnerie in the 1990s and a high frequency chronometer in the 2000s. 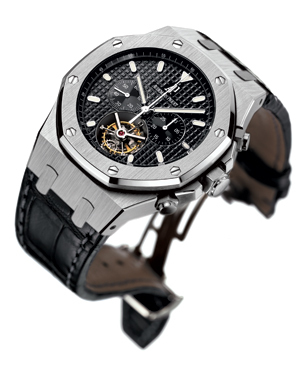 Audemars Piguet is also one of those rare watch brands that is still owned by its founding families — in this case, both Audemars and Piguet. I try on the Royal Oak Tourbillon Chronograph 44mm for size — it was their first steel high end watch in the early 1970s — and a handsome one it is, with its luminous hour markers on a black “Grande Tapisserie” patterned dial and textured rubber strap. Whether you’re familiar with the world of watches or not, you’ve probably heard of the tourbillon — a highly complicated and challenging, gravity defying mechanism that is often shown off in a rotating cage on the watch dial to demonstrate how intricately it works. This one, comprising 216 extra parts, shaves off the 3–5 second inconsistency that comes with your average kinetic charger. The price for this temporal pedantry is $255,000. But then, who can put a price on time? The Royal Oak Tourbillon is the kind of watch you see coming and since I am more for understatement, I would actually go with the wafer that is the extra thin Jules Audemars 41mm rather. Elegance on a strap, and a clear reminder of the quality that put the brand among the world’s foremost watchmakers, the 18 carat pink gold case, silver toned dial, brown alligator strap and gold buckle, add up to a lot of lightly worn class. A comparative steal at $30,000, it’s got sleek sophistication, and we can bet that it’ll stand the test of time, generations down the line.